Hortus Camdenensis | Citrus myrtifolia Raf. Spineless tree with rounded top, the leaves narrow and pointed, the flowers white, followed by round, orange fruit, bitter to the taste. To 8m. [RHSD, Hortus]. Often grown as an ornamental pot plant. 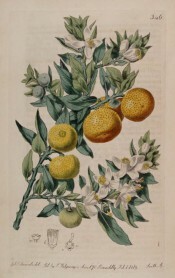 The ‘Myrtle-leaved Orange Tree’ was figured in the Botanical Register. ‘In the Synopsis Plantarum of Persoon, we find our plant [Citrus aurantium var. myrtifolia] separated from Aurantium as a species; but without the statement of any distinction which was not known to every botanist, or the pretence of experience. We believe the alteration to be purely empirical. The plant has been known in most of the European collections for at least a century. It was familiar to the learned and sagacious editors of the Hortus Kewensis, as well as to Mr. Aiton, the late intelligent superintendent of the establishment which gave rise to that classic work, but has never before been recorded as distinct from Aurantium; and until we have proof of its being so, it seems safer to let it remain the variety it has been usually deemed. In two very recent treatises on the genus, cited in the above synonymy, our plant is always spoken of as an undoubted variety of the Common Orange. In one of them it is described as a sub-variety of the variety known by the name of the Dwarf Orange, differing from that in having the leaves more pointed. It is chiefly cultivated for ornament or curiosity. The Citrus japonica or Japan Orange-shrub, is described with leaves and fruit no bigger than that of a cherry; but the latter is said to be of a grateful taste and sweet in that, while in this it is sour and bitter. The finest plants we have seen of the Myrtle-leaved Orange-Tree, are in the gardens of Sir Joseph Banks at Spring-Grove; from a branch of one of which the present drawing was made. The heads of the trees are round, full of regularly disposed branches loaded every year with bloom and fruit. The method pursued by Sir Joseph in obtaining such, has been by ingrafting a full-grown strong stock of the Common Orange, with at least six scions of this variety, instead of a small stock with only one or two, as is the usual practice. The species is native of India; and was introduced by Sir Francis Carew before 1595.’ [BR f.346/1818]. Published in the 1850 and 1857 catalogues as ‘Myrtle-leaved from China’ [Orange Tribe no.13/1850]. One plant of the Myrtle Leaved Orange was donated to the Sydney Botanic Garden on September 27th 1847. [RBGS AB]. This plant may have been imported by Macarthur directly from China although I have no documentary evidence of this. More details about Citrus myrtifolia Raf. Citrus aurantium L. var. myrtifolia Ker-Gawl.